One of my goals this year is to get more organized. I'm a pretty organized person, but I haven't had the money to properly keep certain areas the way I really want them. So, I plan to tackle those areas one by one this year. 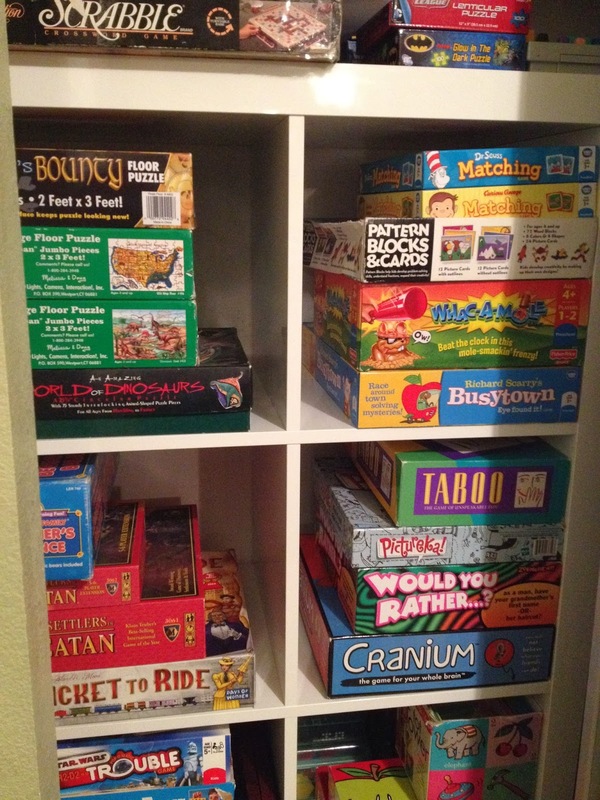 This game closet has been plaguing my mind for years. Since we moved in, actually. 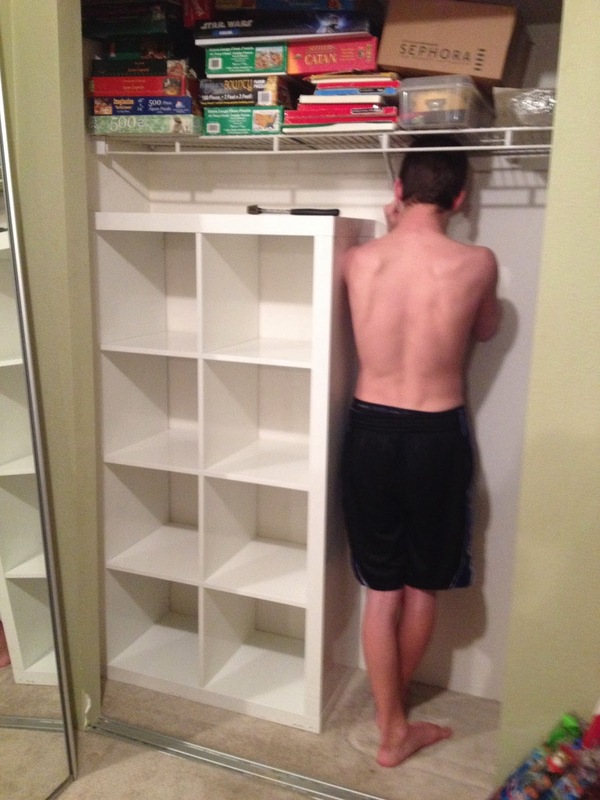 The house I lived in in Utah had SO much storage. 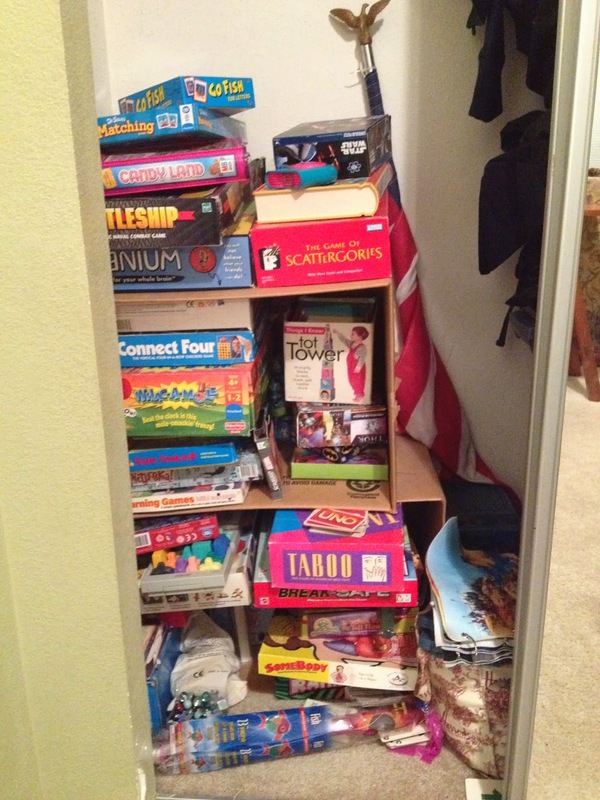 I had an entire walk-in closet for games and it was wonderful. 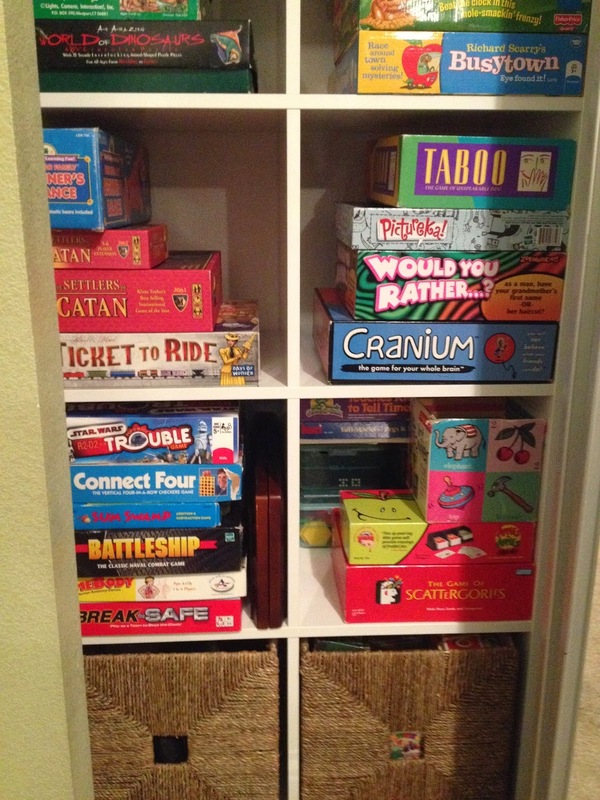 We play a lot of games, and back when I homeschooled, I had many more than I do now. 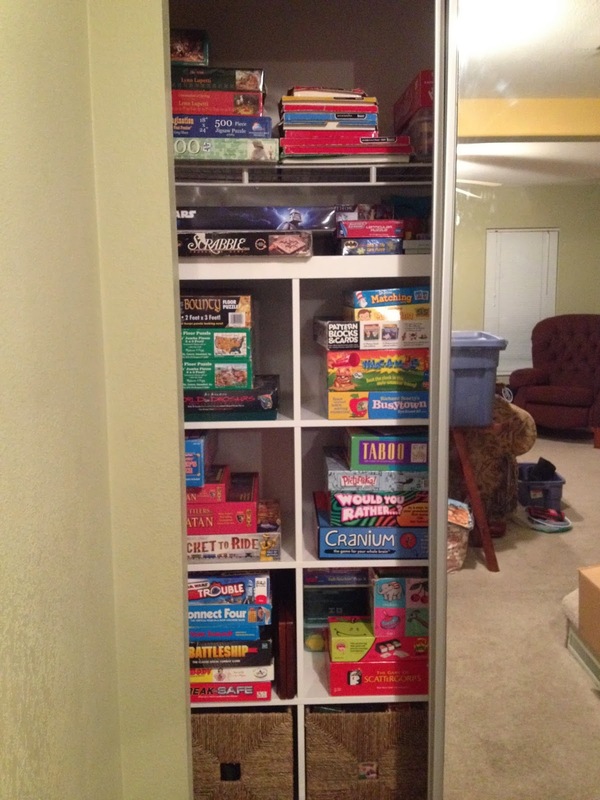 When we moved to this house in California (8 1/2 years ago) there was no such storage space. 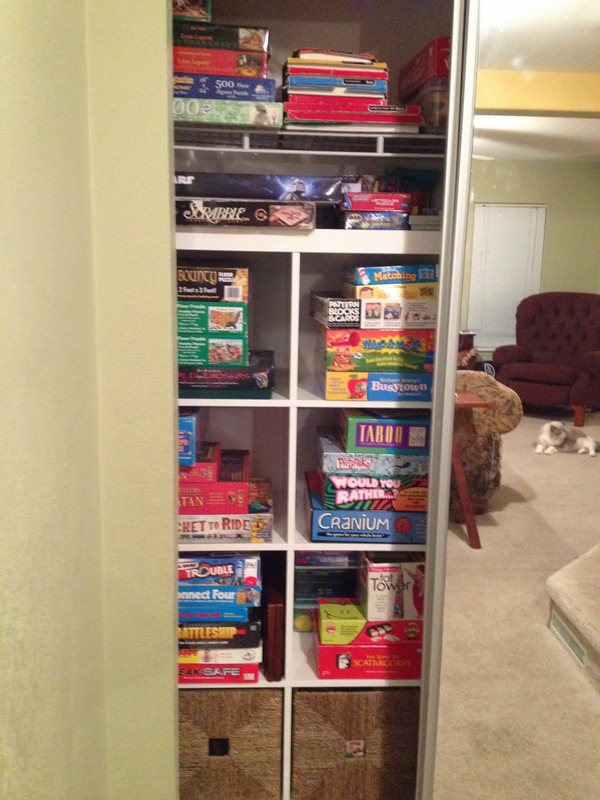 And since the shelves in my old house were built in, I had no shelving (nor money to buy any) for the games. I made do with cardboard boxes, but I was aware of how tacky that was. And it made playing the games on the bottom tricky. But today I had to make a trip to IKEA to get some room-darkening blinds (I've begun the night shift! A post on that later.) 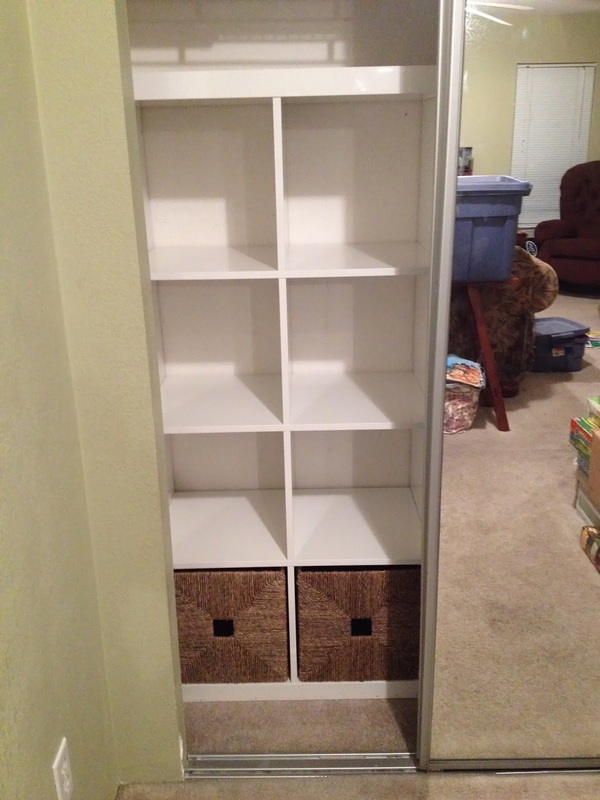 and figured while I was there I'd get a shelf unit for the games and a new bookshelf for the boys' room. 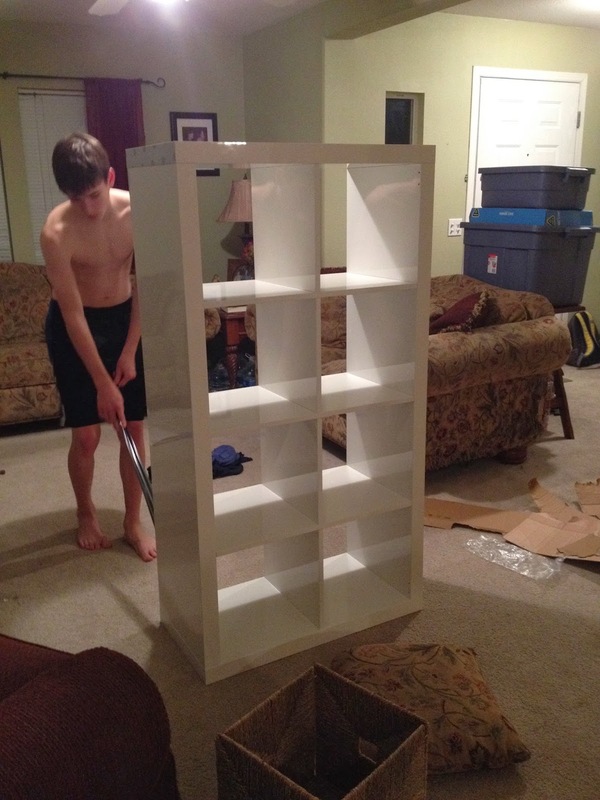 The fewer trips to IKEA the better. 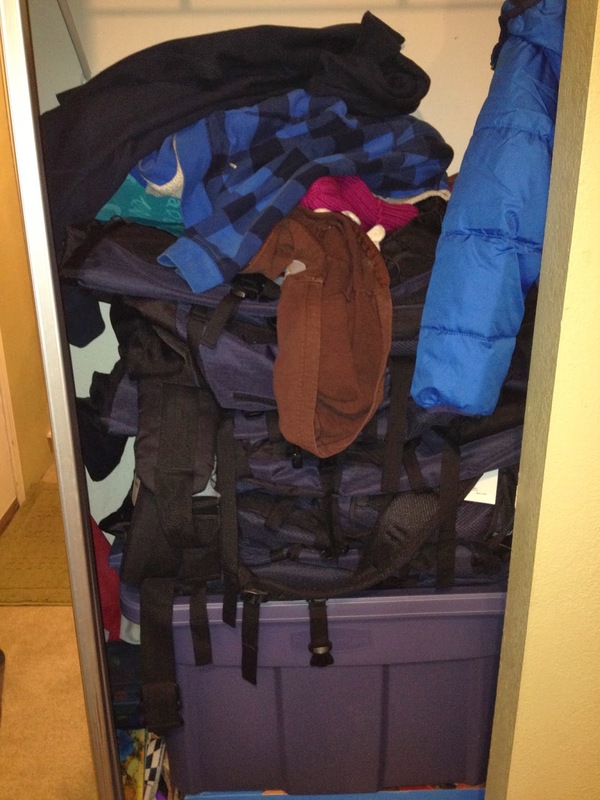 You can see that this closet is just a disaster. I've donated so many games to pare down what we had, but still, what an eye-sore. 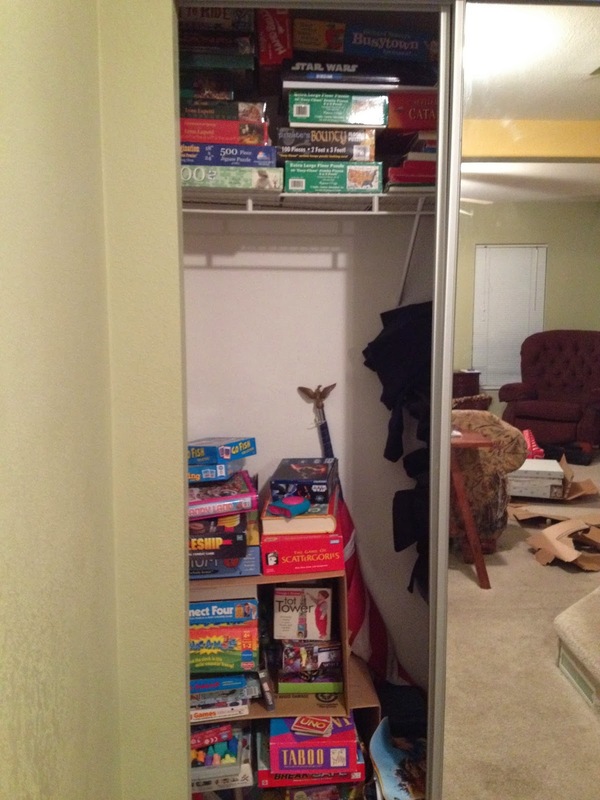 Also, the space is so odd, as the closet goes way back in on that right side, making anything you put back there hard to get out. 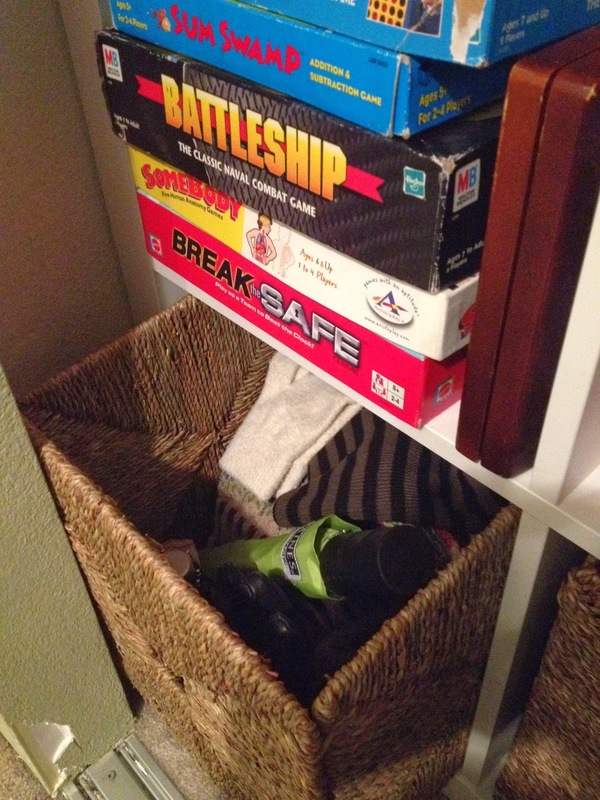 I also keep our emergency supplies/72 hour kits in here, and I still need to figure out a better system for those, but for now, I wanted to get the games tackled. 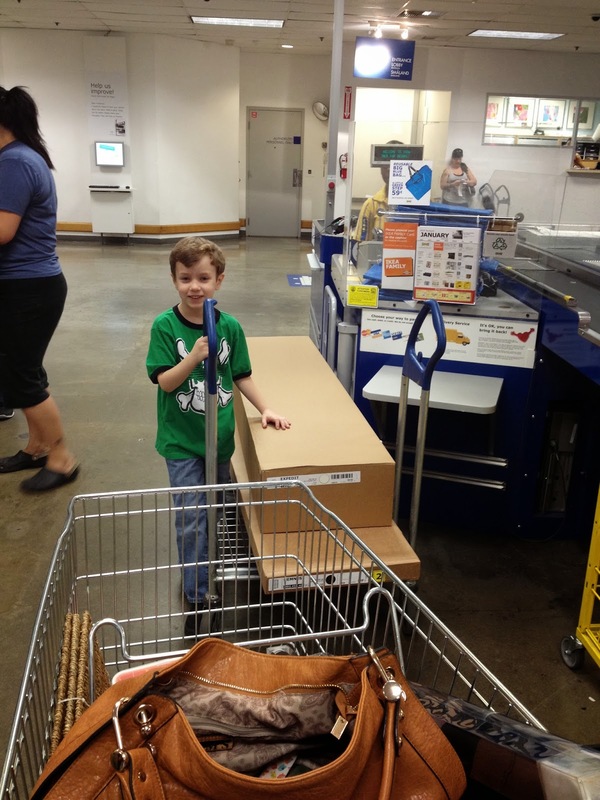 Conor and I made the IKEA trip. Aiden was riding dirt bikes with his friend. 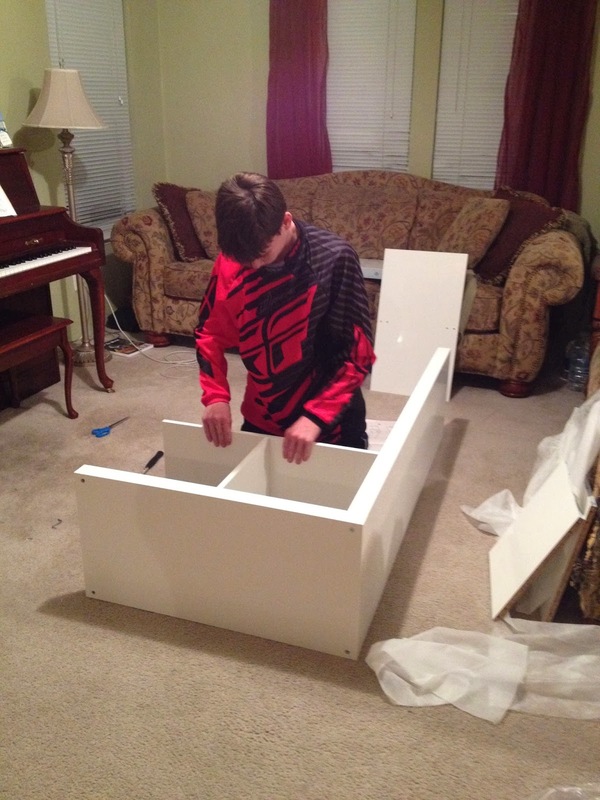 It wasn't until he got home that we broke the news to him that he needed to unload the boxes from the car and start building. But he was happy to do it. He's so great to have around! 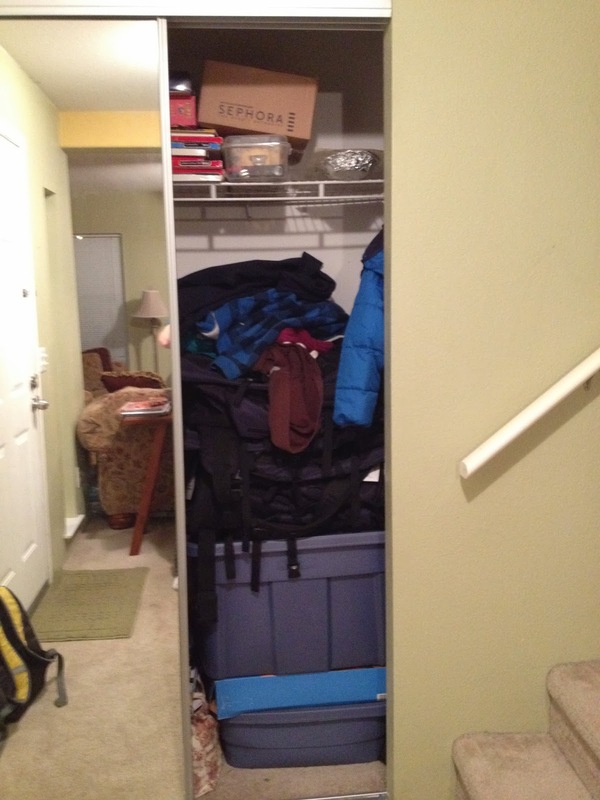 Conor got to work unloading the closet. See that Busytown game? That was a Santa gift this year for Conor. Wish I'd found it earlier. I have a post about that game. Highly recommend it! 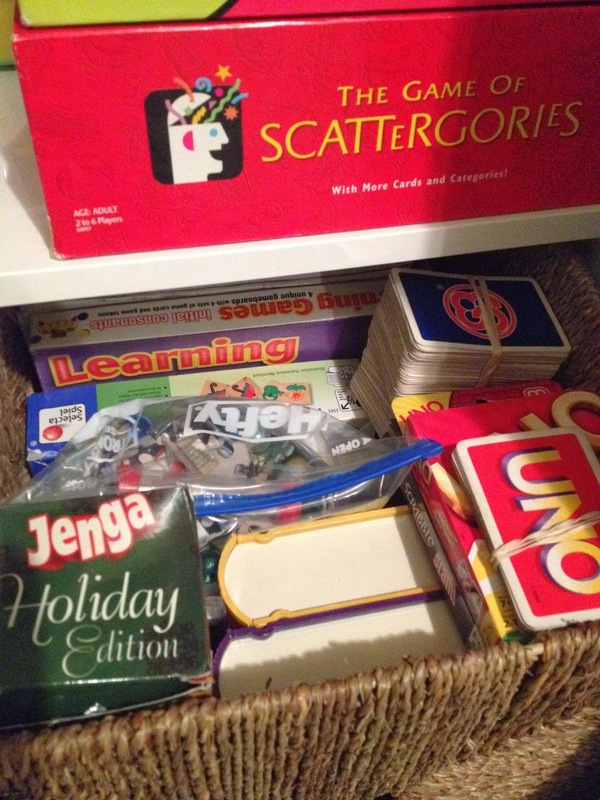 In the two drawers at the bottom, I put preschool games and card games in one, and weather-related accessories (gloves, hats, scarves, umbrellas) in the other. I moved the 72 hour kit backpacks to that far inside space and this bucket contains emergency food and equipment. The red and white bag is the car trip/Conference bag, full of tiny games and maze books, etc. 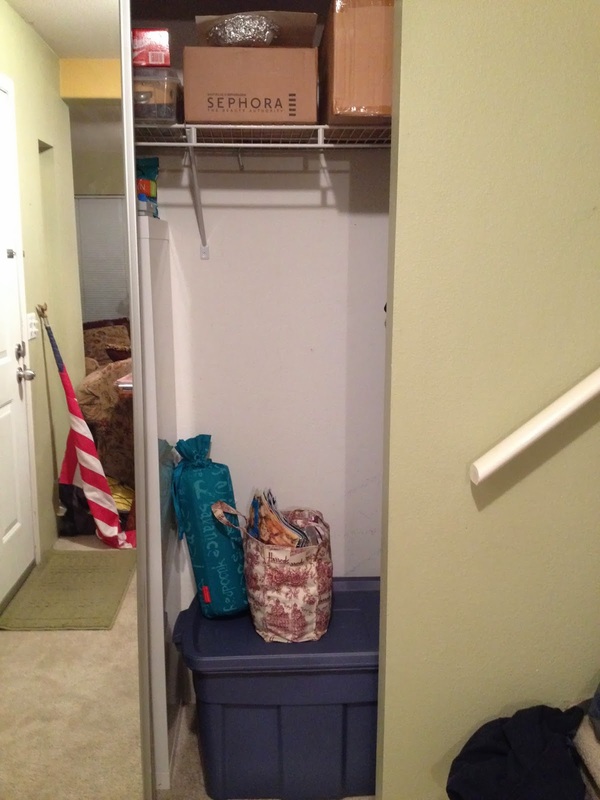 This side of the closet could still use some work, but for now, it will do. It's so much better and more useful now! 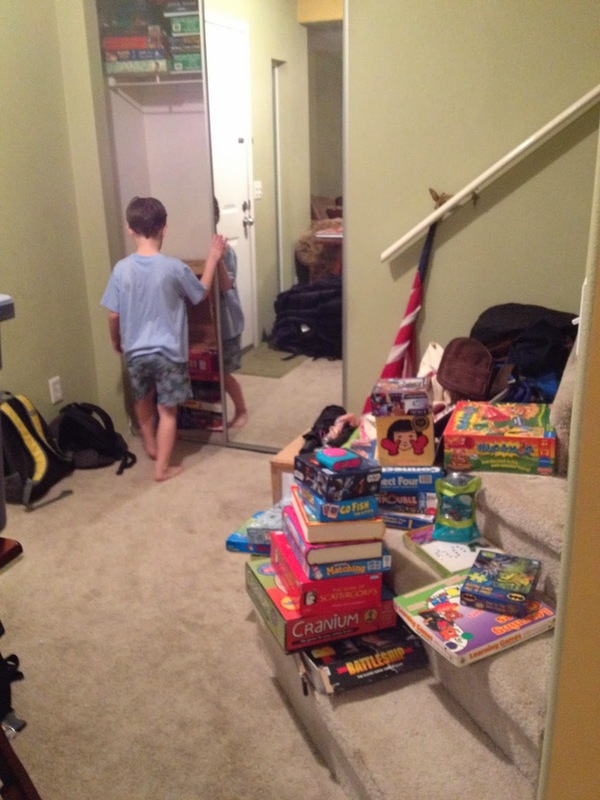 And of course, the boys are excited to play more games now that they're more accessible. 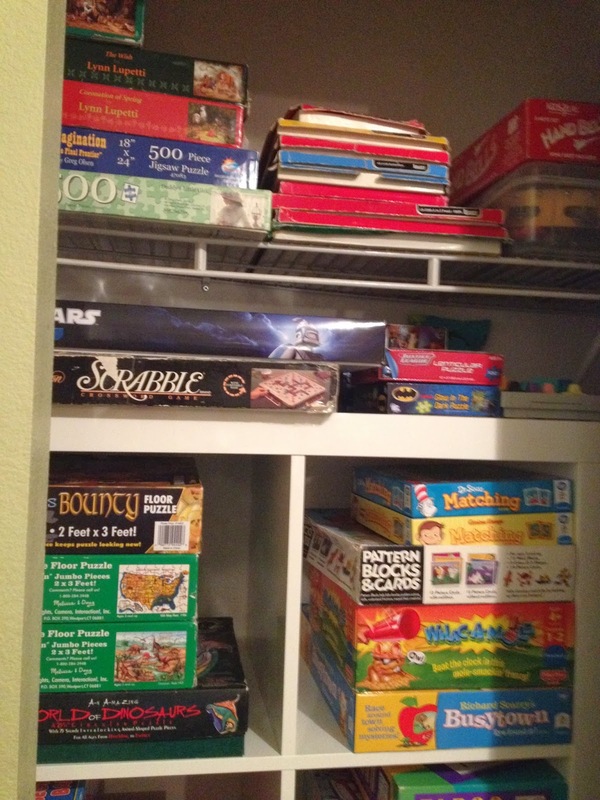 Organizing a closet is so cathartic...makes life just feel better! organization,that it what I'm talking about yes!